^ Hurst JW. 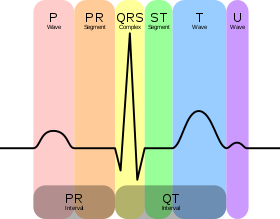 Naming of the waves in the ECG, with a brief account of their genesis. Circulation. 1998; 98(18); 1937-42. ^ N Engl J Med 2008；358：2016－23. ^ Rhinehardt J, et al. Electrocardiographic manifestations of Wellens' syndrome. Am J Emerg Med. 2002;20(7):638-43. ^ Hrtst JW. Criculation 1998; 98:1937-42.